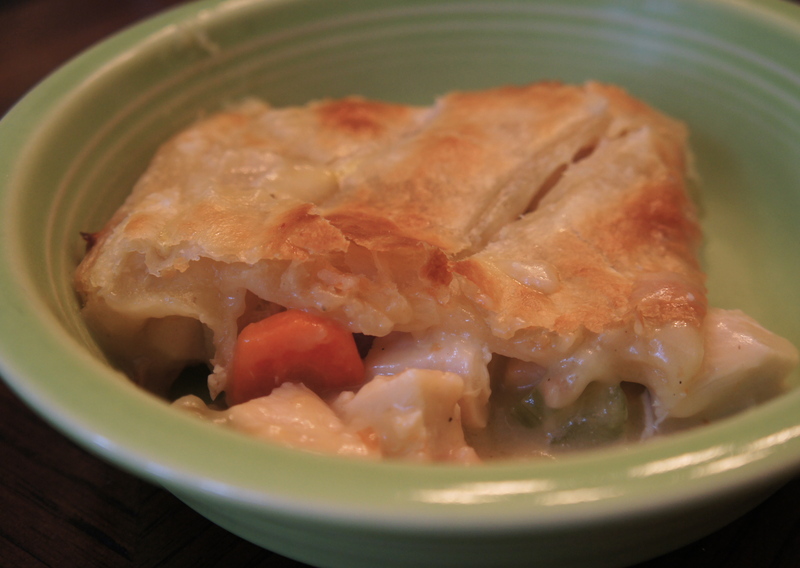 Chicken pot pie is a daunting recipe. The idea of making dough from scratch is enough to deter me (not to mention the fact that dough and heavy cream aren’t exactly health-friendly.) Unfortunately, I find restaurant chicken pot pies chock-full of things I’d rather not find in my pie– I’m looking at you, mushrooms, peas, pearl onions, thyme. Thankfully, advances in modern food technology have left us with freezer sections full of dough and plenty of blogs to scour for the perfect recipe. Well, I found it over at Eat, Live, Run. I’ve made this recipe three times now and it’s one of the best things I’ve ever eaten. It takes me about two hours to make, but it’s worth it. Even the leftovers are amazing. 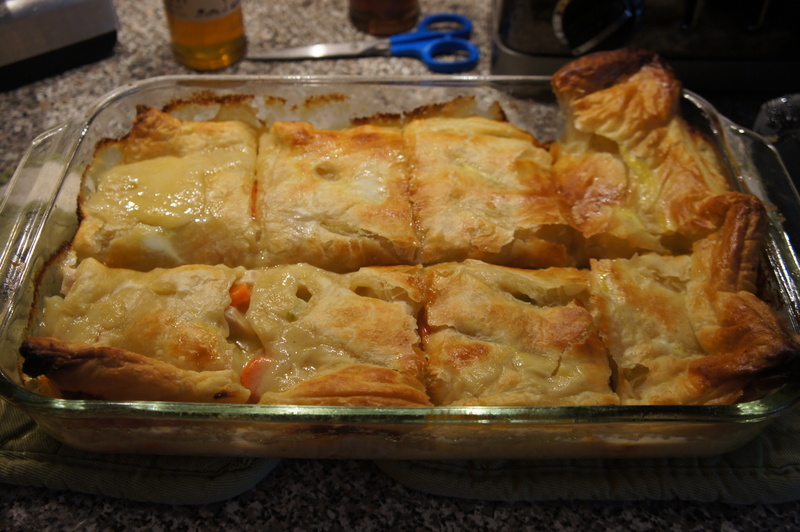 The only changes I’ve made to the recipe are a reduction in puff-pastry sheets and half an onion, since I’m not a huge onion fan. 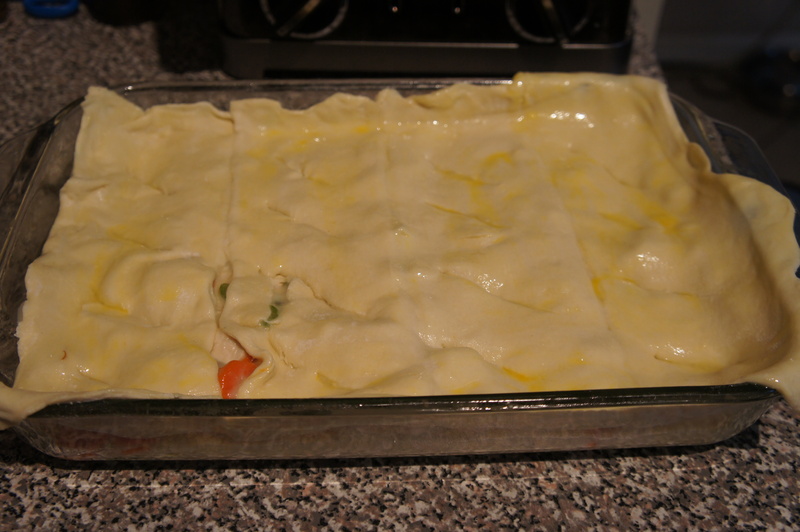 Take puff pastry sheets out of the freezer to defrost. 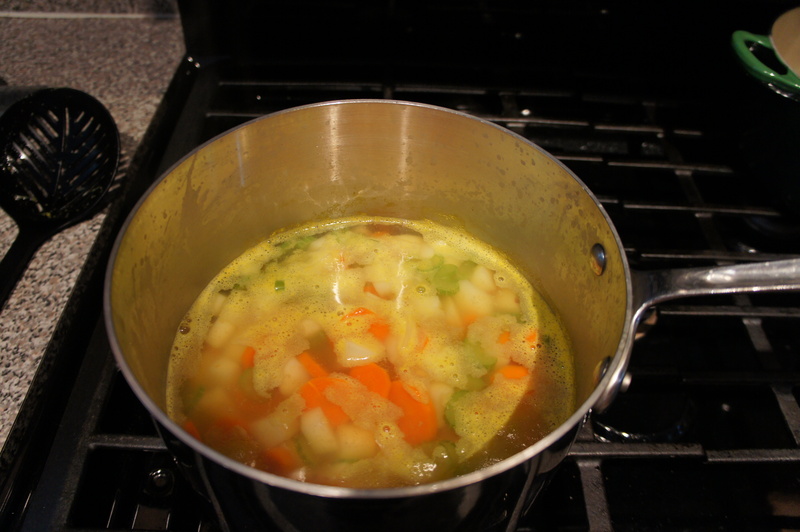 In a large pot, bring stock to a boil and add carrots, celery, and potatoes. Simmer for about 15 minutes, or until veggies are tender. Remove veggies with slotted spoon and pour stock in a large measuring cup to save for later. Fill the pot up with fresh water and bring to boil. 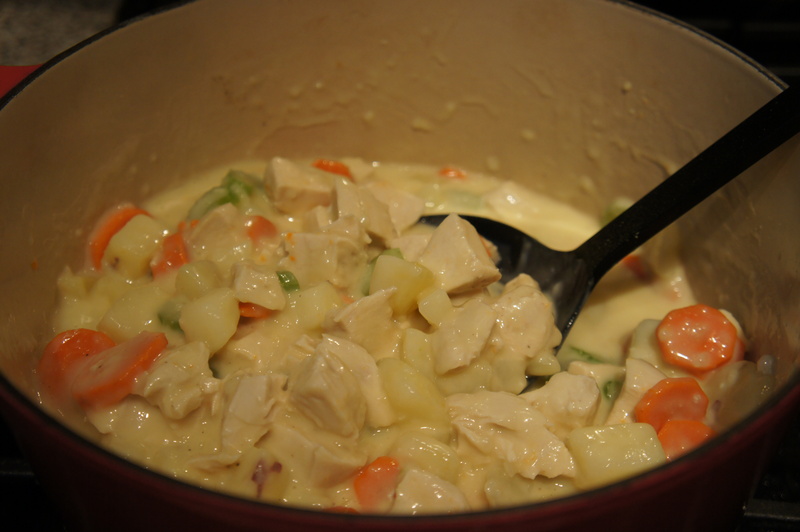 Add chicken breasts and let simmer for about 15 minutes, or until cooked through. 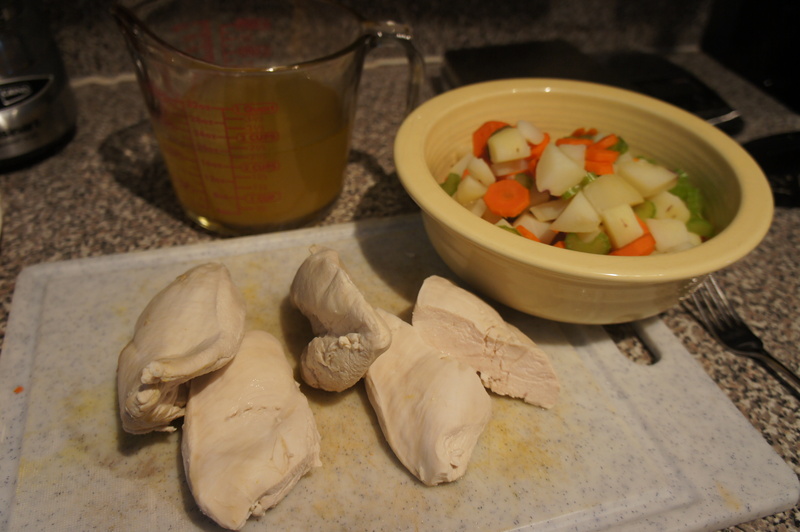 Drain and let chicken cool before cutting into cubes. Preheat oven to 425. Melt butter in a dutch oven. Add onion and cook for 6 minutes, stirring occasionally. Add flour and stir constantly to make a roux. Cook another 5 minutes, or until the roux begins to smell toasty and darken a bit in color. Slowly stream in reserved stock while stirring to make the sauce (it will get thick). Cook and stir for another three minutes. Turn off heat and slowly stream in the cream. 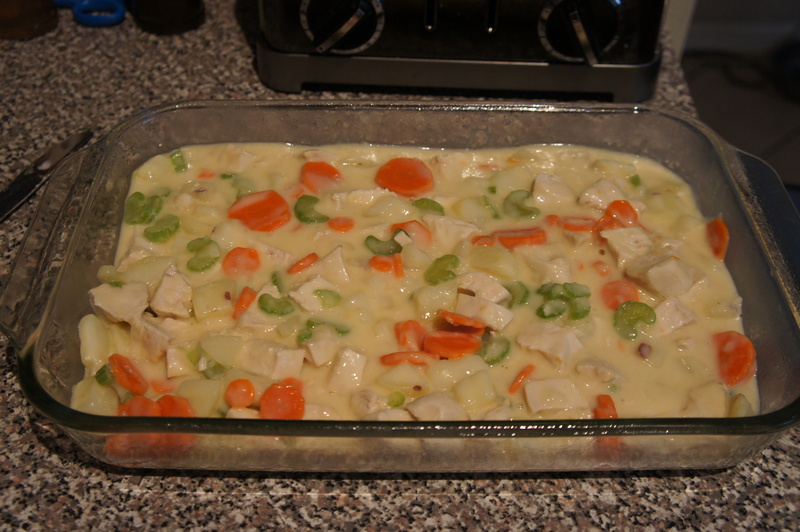 Add cooked veggies and cubed chicken back to the sauce. Season with salt and pepper. Pour pot pie filling in a large casserole dish (at least 2 quarts) that you’ve sprayed with nonstick spray. Unfold puff pastry sheets and gently lay over the top. You may want to roll them out. Cut small slices in the pie to let steam escape. Brush dough with beaten egg. Bake for 10 minutes. Cover with aluminum foil and bake 25 more. You may want to check near the end that the middle is browning. If not, cut a hole in your aluminum foil.